Protesters in Kenya have released a pig and about a dozen piglets outside parliament to show their anger at newly elected MPs demanding higher salaries. The animals licked blood spilled by a protester outside the parliamentary gates in the capital, Nairobi, reports the BBC’s Anne Mawathe from the scene. 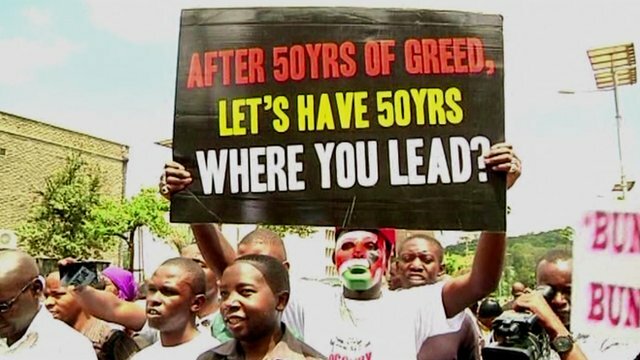 The unusual demonstration, organised by civil society groups, was intended to portray the MPs as greedy. The MPs are demanding a monthly salary of about $10,000 (£6,540). Kenya’s Salaries and Remuneration Commission (SRC) has recommended that their salaries be pegged at around $6,300. Kenya’s MPs are among the highest paid in the world, and their salaries have often triggered controversy. The average annual salary in Kenya is about $1,700. “We have spilled the blood of the pigs to show that the MPs are greedy like pigs,” said Boniface Mwangi, an organiser of the “Occupy Parliament” march. He and other organisers were arrested by police, Reuters news agency reports. Riot police hit protesters and fired tear gas to disperse the crowd, which had marched from Nairobi’s Freedom Corner. The pig and piglets – brought in a truck – did not seem to be affected by the tear gas, and continued licking the blood, our reporter adds. Earlier, protesters blocked MPs from entering parliament and demanded that they sign a petition rejecting a $10,000 salary. Our correspondent says she saw only one MP signing the petition, though she is not sure he knew what he was signing. Tuesday’s protest comes just days after newly elected President Uhuru Kenyatta added his voice to the clamour against MPs increasing their pay and allowances, the Standard reports. Kenya held presidential and parliamentary elections in March. Parliament is made up of 416 MPs – 349 in the National Assembly and 67 in the Senate. Our correspondent says some MPs have threatened to push for the scrapping of the SRC if it failed to yield to their demands. The MPs say they deserve a $10,000 salary because they work very hard. They also argue that they spend some of the money on their constituents – sometimes even paying for their school fees, our reporter adds. MPs in the previous parliament awarded themselves a $107,000 retirement bonus in one of the last sessions before the election. The package also provided them with an armed guard, a diplomatic passport and access to airport VIP lounges.